Given my love of grains, it seems only right that I have more risotto recipes featuring farro than I do the traditional arborio rice. 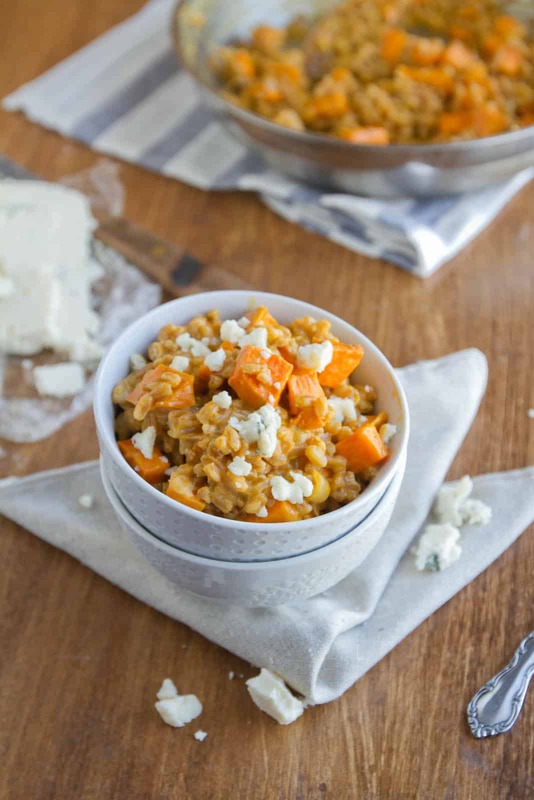 The nuttiness of the farro adds a nice boost of subtle flavor while the roasted sweet potatoes and gorgonzola are the star (two of my favorite flavors together). Don’t be intimidated by this sweet potato risotto, it’s all about low and slow cooking. Plan on making this when you have a bit of a time to spend in the kitchen. Crack open a bottle of wine, turn on some music, and relax into the risotto cooking. Preheat oven to 375˚F. Toss 1 tablespoon olive oil, salt, and pepper with the sweet potatoes. Place on a baking sheet covered with parchment paper. Place in oven and roast, stirring occasionally, until tender; 25-30 minutes. Remove and set aside once done. While sweet potatoes cook, heat a large, high rimmed skillet over medium. Add in farro and let toast, stirring occasionally, for 5-6 minutes or until you begin to smell a light, nutty smell. Remove from skillet and set aside. In a sauce pan, heat water and stock. Reduce to low and let simmer while you continue to cook risotto. Heat remaining tablespoon of olive oil over medium heat. Add shallot and sauté until translucent and fragrant, about 3 minutes. Keeping heat over medium, add wine and let cook until almost evaporated. Add farro and 1/2 cup of the stock. Continue to stir until the farro absorbs the stock. Continue to add/absorb 1/2 cup stock until the farro is tender, about 45 minutes. Test farro every so often. 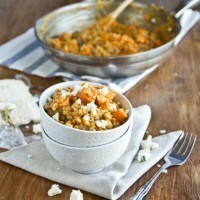 Once farro is tender, stir in Gorgonzola and sweet potatoes. Continue to stir until Gorgonzola is melted. If you like a more pungent taste-add more cheese. Taste and season with salt and pepper. Serve immediately. Risotto is such a great base recipe to have on hand since it’s primarily all about the cooking technique. Once you master the technique and get a feel for getting the farro cooked just right, it’s all about the add-ins. Vegetables: As you can see from the recipes I adapted this one from, squash is another option in place of the sweet potatoes. Butternut, acorn, or delicata squash would all work. Cheese: I am well aware that not everyone loves gorgonzola/blue cheese as much as myself. Try a nice goat cheese or even a smoked gouda instead. Bake it: Not all risottos are cooked on the stovetop. This baked farro risotto version takes the easy route and is less fuss. When looking for farro for this risotto, make sure you pick out pearled farro. While it’s not technically a whole grain,part of the outside layer has been removed to make it pearled which removes some of the nutrients, it’s quicker cooking. sounds divine. is farro GF? I believe not but I think it has a lower gluten content. Looks great and congrats on all the confidence! Have never made risotto with farro, but it looks and sounds delicious. I totally agree about getting more comfortable with cooking and experimenting; it’s as if you can trust your instincts more and more! 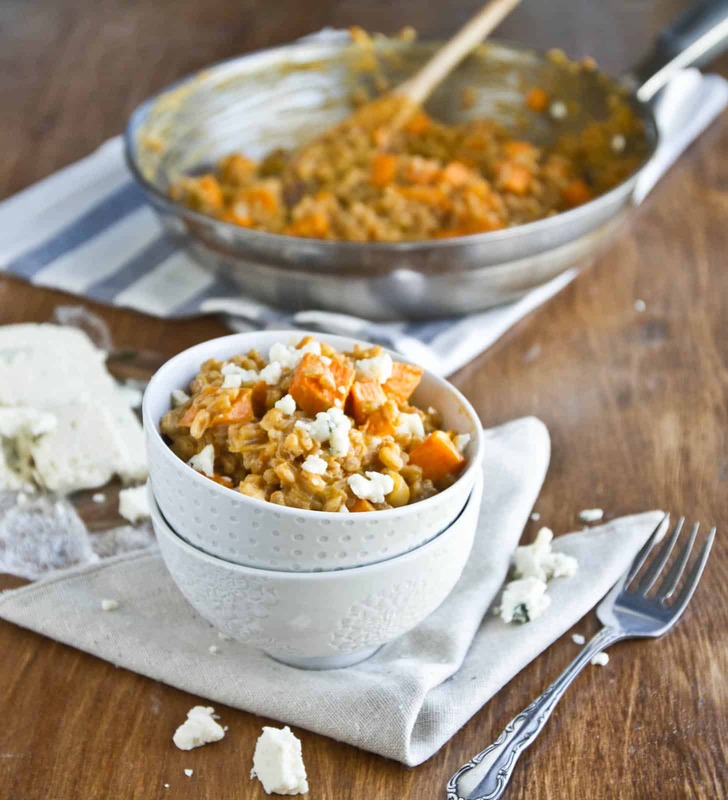 I have been wanting to make farro risotto for a while now, and sweet potato + gorgonzola sounds like a divine flavor combination! Can’t wait to make this. I want that in my belly, like, nowish. I just found your blog today through a Stumble thing, and immediately signed up for it. anyway, practice is indeed everything – I’ve been making baguettes 4 weekends in a row, and finally getting the hang of shaping those things. Not for sissies! This looks divine! I just found your blog from Healthy Food for Living…officially, you are in my reader! Thanks! Yum! Did you need to soak the farro first? Just found your blog…love it! Made this last night…it was amazing! Can you suggest a substitute for Gorgonzola? I’m not really picky when it comes to cheese in risotto, but you will want one that melts well. If you’re looking for a lower flavor cheese, try gouda or even just a bit of parm.